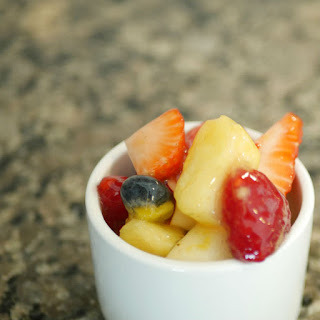 Fruit salads are an easy, healthy dessert to finish off a meal. This recipe uses our Pastamore White Balsamic with Pear Vinegar to add a nice flavor to the fresh fruit. If you're looking for a little extra sweetness, serve with a drizzle of honey. 1. Wash all fruit. Remove core from apple and cut into bite-sized pieces. Remove seeds from peaches and slice into wedges. Remove core and skin from pineapple and cut into bite-sized pieces. Cut strawberries into quarters. 2. Heat a non-stick pan over low heat. Add the Pastamore White Balsamic with Pear Vinegar and peaches to the pan. Cook until the vinegar is reduced by half. 3. Combine all ingredients into a bowl and mix well. Place into the refrigerator and allow to chill for at least 2 hours.